Products made by Flatgoods, a Deksia client that creates eco-friendly, affordable, and completely customizable cardboard furniture, were showcased last weekend at an event benefiting art education for local youth. HURRAH!, an annual fundraiser hosted by the East Grand Rapids Schools Foundation and Alumni Association, was held Saturday, March 22 at the Urban Institute Of Contemporary Art (UICA) in downtown Grand Rapids. The event included food, a cash bar, live music, and a raffle, with proceeds going toward furthering the arts within the East Grand Rapids school district. Holly Lampen, a middle school art teacher for the district, was introduced to Flatgoods while working with founder James Mikrut’s other company, ICON Sign. The school received a grant from the East Grand Rapids Schools Foundation to design twelve giant flags for its campus; while developing the flags with Mikrut, Lampen was shown his work with Flatgoods. “It seemed like a really cool fit for a student artwork auction, where the kids could design the chairs, and we could use them to raise some money,” Lampen said. Lampen utilized grant money from the Foundation to purchase six blank white chairs and four blank white stools from Flatgoods to use for the HURRAH! event. Students from Lampen’s art class drew on one of the chairs, using the blank canvas to create a unique art piece. “We have three elementary buildings, one middle school, and one high school, and each building received a chair to decorate. We also have a couple extra chairs that were printed with sponsor names,” Lampen said. The student-designed Flatgoods furniture was among the raffle prizes auctioned off at this year’s HURRAH! event. The money raised from these pieces will be used to purchase new art supplies and equipment, as well as to bring in artists to work with East Grand Rapids youth. 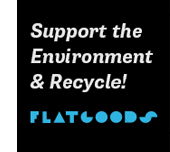 Flatgoods currently offers kids chairs, cubbies, end tables, square tables, adult chairs, coffee tables and more in natural stock, white stock, or with a printed design. To purchase a Flatgoods custom furniture display piece for your home or business, head over to the company’s Kickstarter page to pledge.